Nature is not cruel, only pitilessly indifferent (Richard Dawkins). The poor, sad drones are being evicted from the hive. We are now moving into autumn, and the workers are kicking out the drones because they have no use for them any more and they are considered to be a drain on precious resources. The drone cannot feed himself – he doesn’t have a proboscis for sucking nectar from a flower. He cannot defend himself, as he has no sting. He cannot make honey. Luckily for him though, he is good for one thing – and that’s wooing the queen bee and seeing to her intimate, feminine needs. However with the change of season, the queen is moving into a phase of celibacy – and just wants to spend winter with the girls. So, poor old Mr Bee, without even having committed any crime, is sent unduly packing. I would like think that there is some sort of Winter Rest Haven for Bloke Honeybees – somewhere to repair to after a heavy, hedonistic summer of eating, drinking and lots of bee nookie (and precious little else). 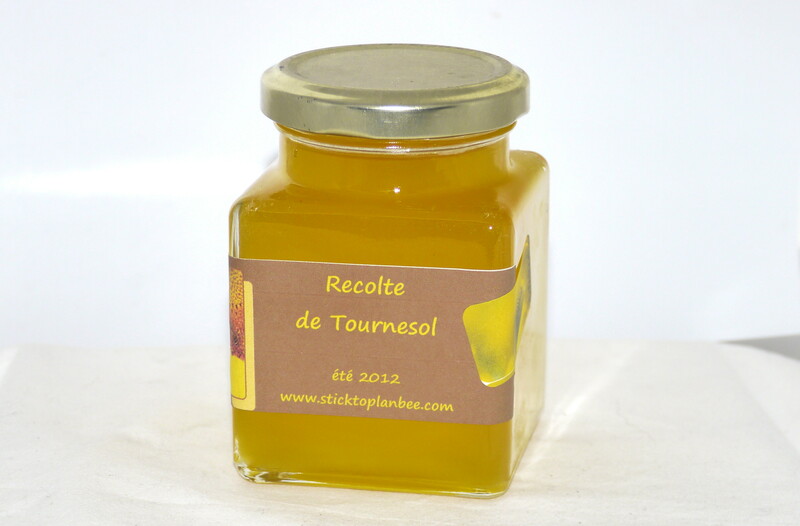 We have honey – our very first harvest! Following much the same process as we did last week, with JP’s hive – in one hour, we had removed the honey frames, cut off the wax cappings and centrifugally extracted all the honey. Along the way, more lessons were learned too. A top tip to remember for next time is to properly zip up the beekeepers suit. Andy must have left a small, bee-sized gap and was visited on the wrong side of his hat by one of the ladies. He did keep very calm, adopting a strange crouching position and managed to successfully shoo said intruder back into the open air without either of them suffering undue harm. 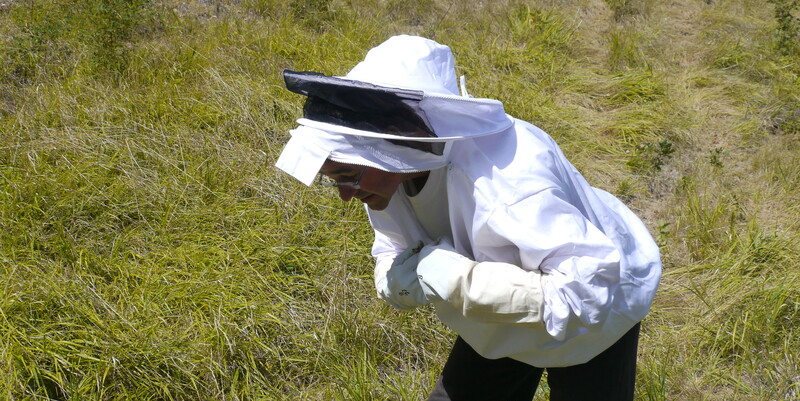 Despite Andy’s little adventure, I realise that it is important to start trusting the beekeeper’s suit. 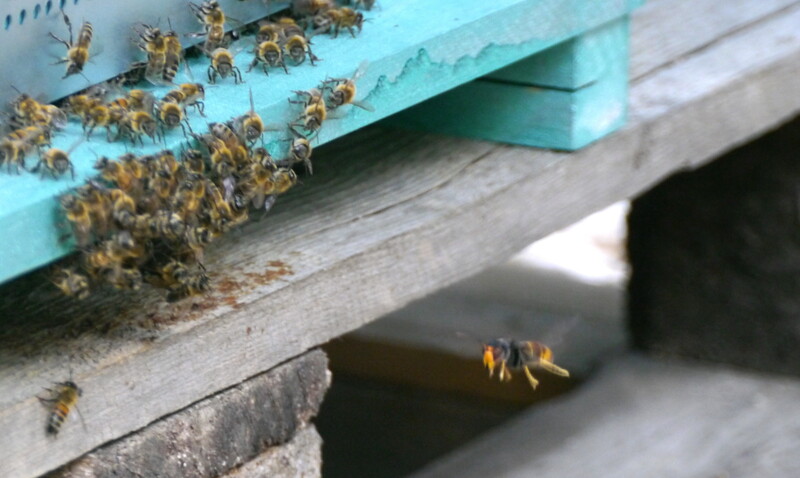 With inquisitive bees buzzing around one’s head, it feels natural to back off – but so long as one carries on calmly and efficiently, keeping aware of any change in the bees’ mood, its okay to be right in there working on the hive. Another tip is perhaps to sport gloves, even if only photographing, albeit from a short distance – JP was stung on the hand. Bees can be camera shy. I wondered what to do with the messy mix left after the honey extraction, and decided to leave it to strain – and was happy to discover that this yielded about 300 ml of extra honey. The wax was then washed in warm water and has been melted down for a future project. We estimate a yield of around 8 kilos of the scrummy, sweet stuff – its all still sitting in the settling tank, waiting to be put into jars in a few day’s time. Time to reach for the honey recipes!